I was not expecting to like this book with how the last book ended. I was hoping it wasn't going to be annoying with Feyre being back with Tamlin and it wasn't. 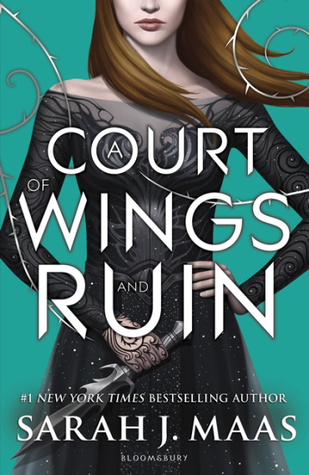 I was impressed with how well Feyre handled everything and how well she took down the Spring Court. It was amazing. The war that was talked about so much in the last book finally happened in this book. And it was epic. The author did a great job making me feel like I was right there fighting with everyone. I was thrilled that Nesta and Elain helped when they did. They proved that they could be strong too. Feyre was amazing like always. She is by far my favorite female lead. I love how strong she is and how Rhys is with her. How he doesn't "let" her do anything, she is her own person and can make decisions for herself. I was glad Lucien went with Feyre, though and I really look forward to more of his storylines in the future. I hope Elain falls for him and they can be as happy as Feyre and Rhys are. Just like I can't wait to see more of Cassian and Nesta. I hated Nesta at first but I really warmed up to her in this book. Turning into a fae changed her and it was awesome to see. Now I can only hope that Azriel and Morrigan can find their true loves as well. I couldn't get enough of the Rhys and Feyre moments. They are just so perfect and adorable. I loved the scenes when Tamlin and Lucien saw them together. Especially when Lucien saw how happy they truly were together. But in the end, I'm glad Feyre wished Tamlin happiness. It showed how much she grew and matured. I'm starting the next book now so I can't wait to see what awaits me.